After waking up this morning and realizing that once again I hadn't bought coffee, I headed out the door. My first stop was the Peet's coffee down on Broadway, right next door to the Plaid Pantry I used to work at. When I stepped outside I ran into Portland the Hobo again and bought him a coffee while he told me an awesome story about getting people's sentences reduced through some loop hole while he was in prison. Great story while I sipped my morning brew. 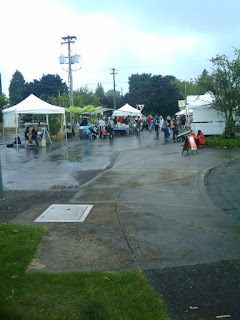 I bid Portland a found farewell and headed over to the King Farmers Market to see what was happening there. 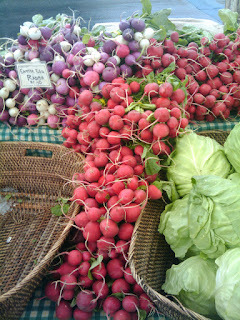 Lots of fresh, good vegetables, live music and tons of hustle and bustle. I didn't purchase anything there and decided to head over to another Market on Stark, the MONTAVILLE market. Here it was basically the same thing, even a few of the same sellers. I purchased a bunch of romaine lettuce and a wad of cilantro. I rounded out the day by doing some supermarket grocery shopping and then headed home to make some dinner. Fresh asparagus, rice and catfish is what I ate while I watched THE FANTASTIC MR. FOX, it was the first time I had seen it and it was really, really, good. Now, its back to work once again. I pray for permanent weekends.